Lejos del ajetreo de la vida y se encuentra entre el pino ponderosa y árboles de álamo se sienta; Cabina en las Wildwood. Sólo 1/4 milla a pie del río Bitterroot, esta cabaña de una habitación puede ser todo lo que necesita para recuperar su tranquilidad desde el torbellino de la vida. Esta cabina sencilla y rústica, pero con gusto acogedor le llevará de nuevo a una época donde la vida era mucho más sencilla. Un lugar donde la vida de la granja se encuentra con la vida salvaje, y todo lo que tiene que hacer es reloj. Y, la cabaña de troncos de una habitación recién construida se completa con muchas ventanas para ver que suceda a tu alrededor. Una cama con dosel de madera tamaño queen con sábanas es donde descansará al final de un día ocupado (o no tan ocupado) disfrutando de la maravillosa vida de nuestro hermoso valle de Bitterroot y todo lo que ella tiene para ofrecer. The Cabin In The Wildwood es una cabina seca, (sin agua corriente). Pero se proporciona un enfriador de agua y un fregadero, con un recipiente de "agua gris" debajo del fregadero para lavar los platos. ¡La instalación de su baño completo está a solo 30 segundos a pie a través de la hierba hasta una entrada exterior privada (solo para nuestros huéspedes) en la casa principal con toallas limpias y agua caliente! Un cuarto de milla a pie ocasional que lleva a un 5 acres privada "parque". En propiedad conjunta con los propietarios de tierras circundantes, se sienta en el borde de nuestro hermoso, y abundante río Bitterroot. La cabina se completa con una pequeña gama con horno, fregadero, nevera, microondas y cafetera. Platos, ollas y sartenes, cubiertos y vasos están disponibles junto con una barbacoa si le apetece cenar. Una chimenea y mantas adicionales serán proporcionados en el caso de las tardes de Montana son un poco más fría de lo que esperaban. meses de verano las temperaturas pueden llegar a 100, pero es muy raro. Una cosa con la que siempre puedes contar: se enfriará por las noches. Estamos situados aproximadamente a medio camino entre Darby y Missoula, un tiro al norte recta o al sur en la autopista 93. Las montañas Bitterroo al oeste y las montañas de zafiro al este. Una magnífica unidad que no olvidará! Cinco millas de la cabina está en Kootenai Creek sendero, una caminata impresionante a través de las montañas rocosas junto a las cascadas de agua dulce que son el Kootenai Creek. Sólo dos millas de las tiendas y restaurantes en Stevensville; donde Montana comenzó primero! St. Misión de María, Herrero y Wildwood Breweries, Creamery picnic, Misión Bistro, y Maries Restaurante italiano son sólo unos pocos lugares y eventos para experimentar mientras estén alojados en Cabina en las Wildwood. Despertar con el sonido de numerosas aves que hacen que el Wildwood su casa. Ver los ciervos, alces o alces hacen su camino al agua cada día a medida que viajan por el bosque en la frontera sur de la propiedad. Un oso y león de montaña también se ha sabido que visitar, sin embargo sólo he sido testigo del oso! Cabaña en el Wildwood podría ser fácilmente las Bitterroots "secreto mejor guardado" .... también podría ser suyo! I was in the Bitterroot Valley area for several days of fly fishing. The Cabin in the Wildwood was absolutely perfect for my needs during that time. It was just like advertised - cozy, rustic, private. I can't remember staying in a place away from home where I felt so comfortable and relaxed. Molly was a wonderful hostess and we struck up a friendship by the end of the week. I would definitely stay here again. Absolutely wonderful! Very cozy and comfortable cabin. I highly recommend staying here! Quiet and peaceful setting. Really enjoyed the firepit in the evening. quail and can walk to the river. Loved the quiet area. Molly was a great hostess. Dreamy PICTURES - Watch out for what you don't see!!!! "Sleeps 4, Bath 1- Welcome to our Cute, rustic, dry cabin with all the amenities!!" Am I the only one who filters rentals by sleep number, bed types, and number of bathrooms? Oh, and the pictures!?!!? As an avid traveler, I took a 3 night stay thru VRBO for a place that was conveniently 10 mins from a softball college camp for my 17 yr old daughter plus 2 under this dreamy description!!! After 11 hours of driving straight thru from Portland, OR to Missoula, MT and getting the owner on the phone upon our shocked arrival; we alarmingly discover that "dry cabin" does not mean "cozy, warm & water-proof cabin", but rather the opposite! No water inside at all!!! A toilet & adorable shower is a mere 500 feet from our cabin's front door to her personal home!??!!?!!? How does VRBO, and other rental sites, etc, not have an onsite assessment of a property before unsuspecting travelers sign up? This property needs to re-write & clearly not use local language and should state: Sleeps 2 & ZERO Bath! Every nook, cranny, window sill, floor space is crammed from the pages of Pinterest!!! Cute, yes for the dreamy pictures of a cabin, but way too much in a very small space for 4 w/ bags. The owner leaves fresh eggs, milk in the mini fridge which is a nice gesture; however with no running, nor hot water, I imagine that all of the silverware, plates, cups, bowls, pots and pans that fill up the cabinets have not been properly sanitized. Once you venture to the bathroom in the owner's home, you will find that there is used shampoo, conditioner, soap, and hand cream; which normally would be okay and hey, I am from Portland where recycling was invented & I admire her for being sustainable; but the fact 4 of us had to walk across two wet lawns and a gravely driveway in pj's while thinking "We've been bait & switched", seems pretty distasteful. Needless to say, we know how to turn lemons into lemonade by embracing the adventure after the owner sadly gave me a 3 paragraphed sob story via text on why she wouldn't release me from one of my 3 nights as a compromise. We found the fun in funky & didn't engage. Mostly, the owner didn't realize that misleading these "City Slickers" would only lead to a BIG CALL OUT review. By the way, WHO wants to meet the owner & her large barking dog in the hallway of her bathroom @ 3am!? I'm thinking you are not the person who left me the nice, "Hi Molly" note on the bathroom chalkboard? I am even amazed you gave the cabin 1 star, with that review, but I suppose zero stars wasn't an option? Like I said on the phone to you at your 5:30 AM arrival, I am VERY sorry you were not happy with the cabin. I want my guests to be happy! 99% of my guests have been. And even more sorry that at your not knowing what "a dry cabin" is, you would not inquire before putting down your hard earned $ to reserve it. 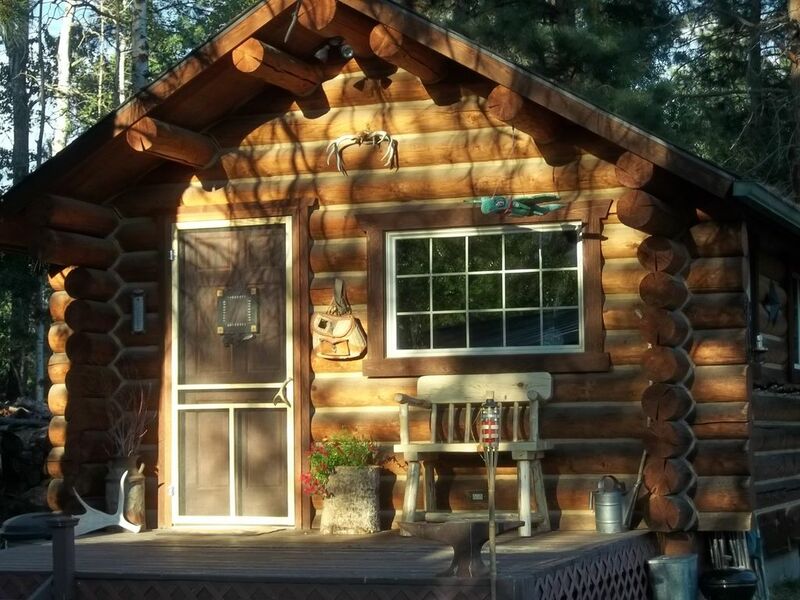 When you told me "you were not cabin dwellers" I wondered why would you rent a cabin? I would have happily answered your questions before you made your reservation, as I did all you had asked for (and even more), by making up the futon for you since you would be arriving "after midnight". It could've been that simple. You would have been happier somewhere else, and so would I. The full description is/was/has been there in black & white from the beginning. In addition to captions under each bathroom photo of where "it" is located. Just a mere reading of guests reviews also gives insight to the "walk to the bathroom". As for the wet grass, its called: "dew" down here on the river bottom. :-) And, you also failed to read the cancelation policy you agreed to when making your payment. As I said in my "sob story" had you contacted me in plenty of time to make the cabin available to others, on your discovery of the dryness of the cabin, I would have worked with you. I am not surprised, nor did I expect a "fair" review from you, and you are entitled to your thoughts and opinions. However, I do take issue with slander. You have NEVER been in my home, and describe meeting me & my barking dog in the hallway. I have NO hallways & the guest bath is private to guests only, and you know that. You also seem to forget mentioning in our phone conversation thinking the water cooler in the cabin was cute, like the one at your work. And yet you say there is "NO water" in the cabin. I don't appreciate your attempt in trashing my livelihood, with falsehoods to cover up the fact you just didn't do your homework. Again, I am very sorry it did not work out for either of us. I wish you well in your other travel adventures, and wish your daughter much success in her softball! My wife and I stayed here during our recent trip to Montana. We enjoyed the cabin, it's rustic charm and privacy afforded by the location. Everything was clean and tidy when we arrived. We would definitely stay here again. What a sweet little cabin, very quiet and peaceful. We of course picked the hottest weekend in Aug. so the fishing was not great but we still tried and had funny at least being in the water and outdoors! There are also some really cute antique shops nearby and some great food! The Bitterroot Mountain area is by far one of my favorite places! Thanks Molly for your hospitality and the fresh eggs sealed the deal for me! Carlana, It was awesome having you and your family enjoy your time here, wether you caught fish or not! And, the fact you returned to our beautiful valley even after last years horrible fire season speaks volumes of your love for this area! Thanks so much for coming, and I hope you see you all again next year! Please read full description of rental. Please note pictures & captions of rental & payment/refund terms. Thanks!